Folks with small children. Looking for some advice. Thread: Folks with small children. Looking for some advice. Our little boy will be 1 in June. I was talking to my wife the other day about how we were going to be able to get out on the boat so much more this year, we didn't get out too much last year since he was a newborn. We typically like to get out early in the morning and be heading home by noon. Problem is it can be tough to find a 3rd that early and we typically would be going out with just me, my wife and my son. With him crawling and climbing on stuff now I'm not sure what is the best way to keep him safe and happy while one of us rides and the other drives. I had thought about getting a swing to hang from the z5 or a seat for him to sit in that we could set on the floor. I'm curious to see what others may be doin. We hang a swing from the tower for my 1 year old, but we also have an 8 year old that helps. My 1 year old will be 2 this year so we'll likely do the swing again. One word of caution, the swing can really start moving around to the point is can go sideways and hit the tower depending on how long the ropes are. It's doable, but my son is a big help. We got a "door jumper" from Babies R Us for $13. I fit rid of the door frame portion and just went around the tower with the straps for Hodges baby. She loves it, around 9 months in this photo. It is a game changer if you are just hanging out..
Two shock cords on the sides? It is a pain but would help with the swinging. You never know when you have to turn quickly. That's a good idea. We considered a bouncy but was unable to have her life jacket on while in it. 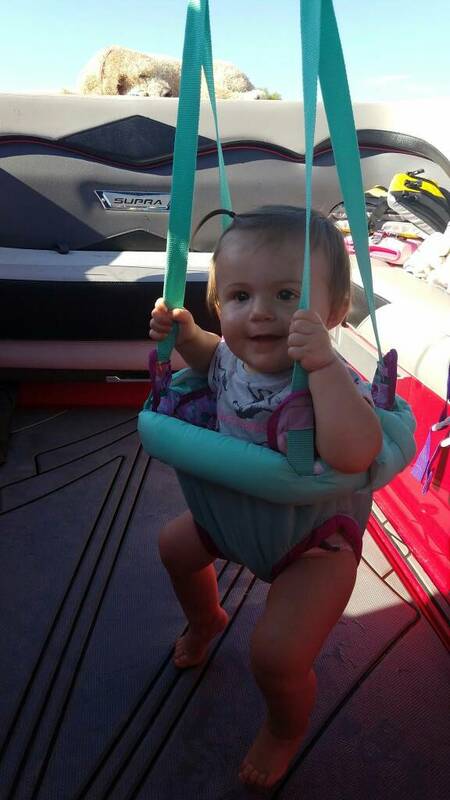 The swing allowed for her life jacket to be on. I'll need to find good places to attach the shock cords to the boat, maybe could use the base of the tower. The bounce seat looks perfect, just need to rig ours up to work on the boat. Thanks for the tips guys. You probably shouldn't have asked "Wonder how far he'll fly if I treat him like a Water Balloon. We had boat toys (boats, turtles, etc). Had his life jacket on all the time and even sat on the seat or under the helm. He would stay on the floor and not on the seats. Squirt bottle for the hot days to mist them and they mist you...Shade. That's a good idea,Thanks for the tips guys. It's funny how much fear a mother has for her babies lol. Don't get me wrong, is dads have fear to but we are a little more realistic with the fear haha.